Pomegranate is a magical fruit, isn’t it? I don’t know if its seeds or its lovely color make it so special, but there is no doubt that it’s a unique fruit! There are several ways of using it; you can add its seeds to cakes, pilaf or salads. It’s always great to garnish waht you have with these bead like seeds! You must see this wonderful recipe of pomegranate sprouts at Macheesmo by Nick. The combination of brussel sprouts, pine nuts and pomegranate seeds is not something I’m used to, but I tried it and it’s fantastic! You will also find a good tip you can use when seeding pomegranates, check that post out! We’ve discovered a new way of enjoying this fantastic fruit, even on the street! Right, on the street when walking! You know it’s not very easy to eat pomegranate unless a devoted person removes its seeds from the skin. 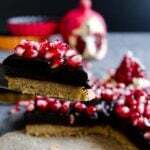 If you feel too lazy to eat pomegranate, there is a great solution for it here! Pomegranate juice as a street drink! Everything becomes easy and tasty when served on the street, right? Lemonade is a popular street drink here in summer and you can see orange juice vendors on every corner in winter. And now vendors have started to make pomegranate juice too! It’s a perfect drink when you are out and need some energy. Health benefits of pomegranate is countless, so this is a great new trend here. Maybe people start to substitute fizzy drinks with this refreshing and inspiring juice! 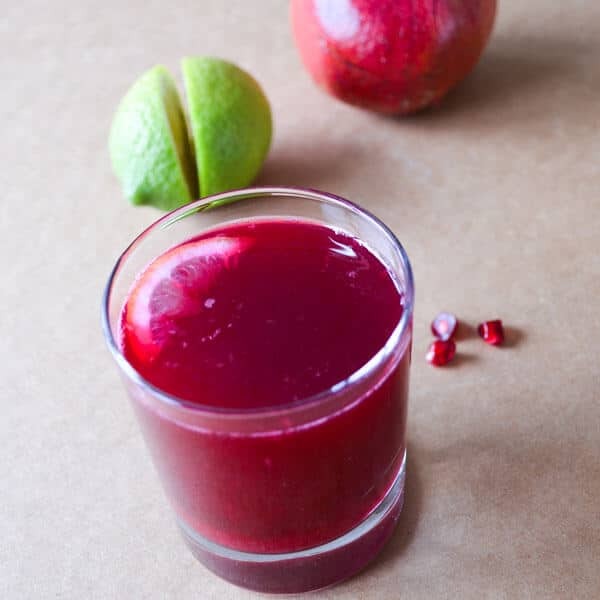 Pomegranate juice itself is so powerful, but I wanted to have my own touch on it to make it even more effective! You know we have to take care of our immune system against cold. What could be added into this energizing drink? My favorite ingredient in winter: lemon! If it’s still cold out there and if you need a stronger immune system, you must try this two-ingredient powerful winter drink, which acts like a shield against cold! Squeeze pomegranates and lemon and mix. As chief cook in our family, I am always encouraged to prepare healthier food after reading your posts. Thank you, Zerrin! My kids always enjoy when I put out a bowl of pomegranate seeds alongside of our dinner meal during the winter season. Here’s a (relatively) easy way to empty them: Bang (moderately) all outer surfaces of the fruit on your counter to loosen up the seeds. Cut the pomegranate in half – across the middle. Empty seeds while pomegranate half is submerged in water – you can be quite aggressive and the seeds will sink while the skin floats to the top. Still a little tedious but much easier (and cleaner) than any other method I’ve tried. Thank you Gayle for the comment! Glad to hear that my recipes inspire you to prepare healthier foods! A bowl of pomegranate seeds is always better than anything bought from the market! Thank you for the tip you share with us about seeding pomegranate. It sounds like a clean way of doing it!